This fairway condo offers excellent views and is a cozy retreat for both golf and beach vacations. Located on 3rd level it has a spacious open common area featuring a high cathedral ceiling with adjoining living, dining and kitchen areas. The living room has a large flat panel television and opens to a spacious deck overlooking a lake along the 2nd fairway of Oyster Bay Golf Links. 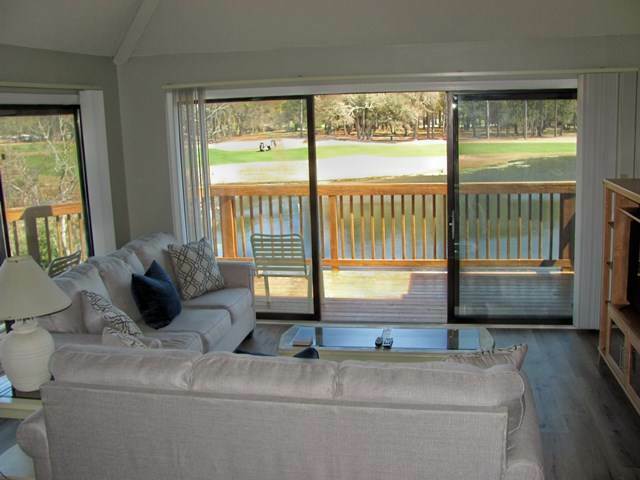 The lake is home to an abundance of native wildlife and the deck provides a perfect spot for bird-watching and relaxing after a day on the golf course or beach. The condo has recently been remodeled with new flooring, kitchen appliances, furniture and fresh paint throughout! The bedrooms have new mattresses and comfortable duvets. Each bedroom has 2 queen beds, a television and an adjoining bath. The condo has central heat & air and ceiling fans in each room with a laundry area and full-sized washer/dryer. The kitchen is fully-equipped with dishwasher, microwave, coffee maker, blender, toaster, full-size refrigerator and range. The dining table seats 4 comfortably with additional seating for 4 at the counter bar. The community has an outdoor pool, hot tub, charcoal grills/picnic area and tennis courts on site. One of the tennis courts also has a basketball goal. Complimentary linens, towels and departure cleaning service are included, .